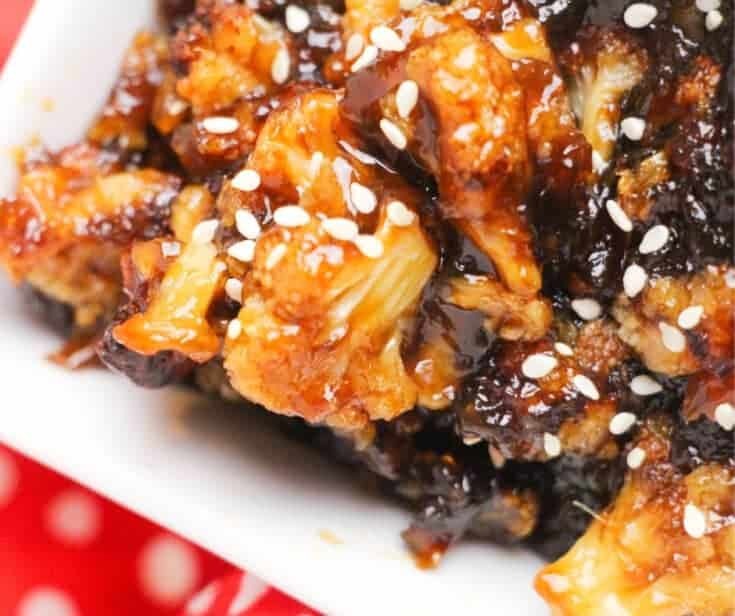 This low carb sticky sesame cauliflower is a delicious, healthy Chinese cauliflower recipe. 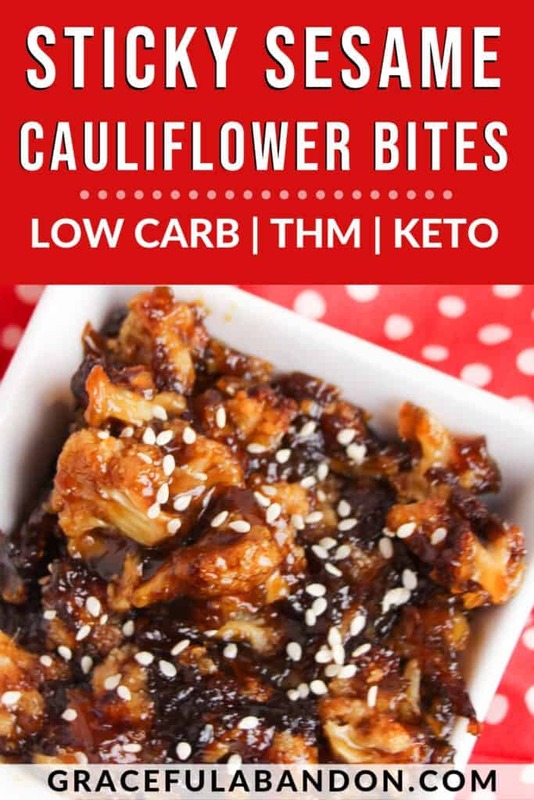 Crispy cauliflower bites are covered with a sweet and sticky Asian Sesame glaze that remind you of your favorite Chinese sticky chicken bites, but it’s all delicious low carb veggie goodness! Even better? It’s great for keto, THM, and low carb. Want a healthy, low carb version of your favorite Chinese take out or Asian mall-food? These taste just like the best sticky chicken bites, but are in fact made of crispy baked cauliflower and a low carb sesame sauce. Yum. Ready in under an hour, this is about to become one of your favorite meals. You can serve it up over zoodles or with your favorite Asian slaw. It’s also good over rice for your kids or anyone who isn’t eating low carb to fill them up and give them those necessary carbs for growing. Sticky “chicken” cauliflower bites are super satisfying, with all the Chinese sauce stickiness you’re craving and none of the bad-for-you ingredients that are in what you get at the local food court. The first step to making this delicious, sticky sesame cauliflower meal is to make your crispy baked cauliflower bites. You need to really slice it thinly, like 1/4″ thin. And then, after you slice your cauliflower thinly and as close to evenly as possible, cut it into smaller bites by cutting each floret in half. This is essential to getting it crispy; if the pieces are too thick they will have too much moisture and be soft (still delicious, but it’s not the same). Next, toss the cauliflower bites in some coconut oil. If you want to add a slightly spicy kick to your sticky sesame bites, go ahead and add 1/4 teaspoon cayenne pepper to the oil before tossing. This is a light coating, to help them “fry” in the oven. The trick to getting it nice and crispy is to not only slice it thinly, but also to spread it out on your baking sheet without any overlapping pieces. Use a good, non stick baking sheet for this. 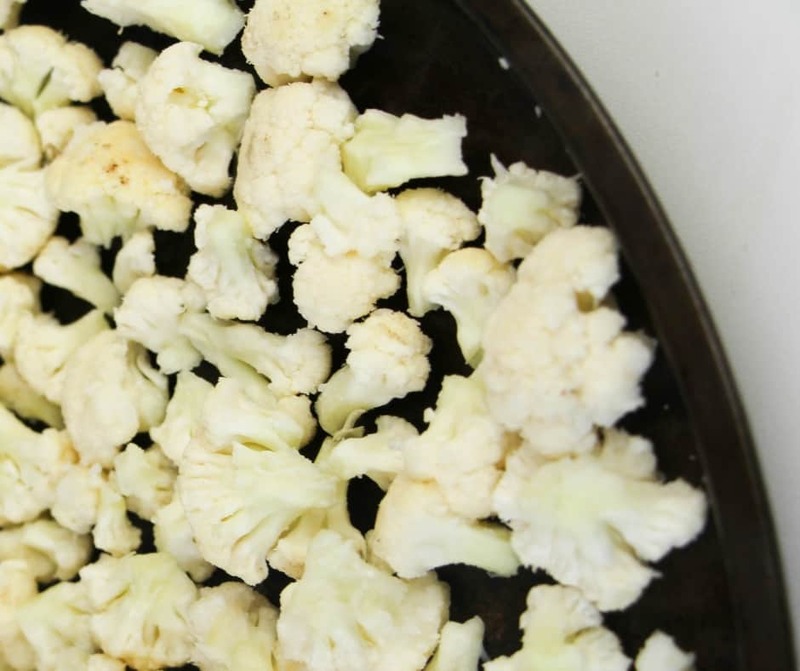 Tip: using a cookie sheet without the air pocket in it is actually going to give you a better crisp on your cauliflower florets. Now it’s time to bake them, turning them over once. You’ll check them around 15 minutes and if they are turning a golden color on the bottom, it’s time to flip them. If not, put them back for another 5 minutes. Once the other side is nice and golden as well (check after 5 minutes) it’s time to take them out and coat them with your low carb Asian sesame sauce. Now, the best part about any sticky Chinese chicken is the sauce. You know it’s true. And that’s what makes this sesame cauliflower so yummy, too! 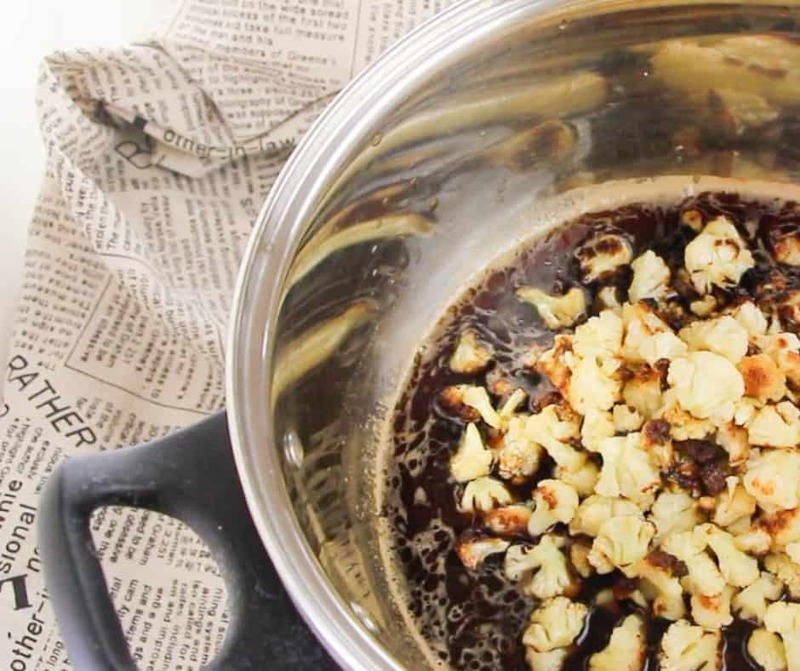 While your cauliflower bites are getting crispy, you’ll make your sauce on the stove. This is where the magic happens. What Ingredients Are In Low Carb Sticky “Chicken” Sauce? I know what you’re wondering. How on earth can sticky chicken sauce be low carb? That’s a good question. The secret is in finding the right ingredients. You can use either soy sauce or coconut aminos for your recipe. Both are great keto options, but if you’re a Trim Healthy Mama or just want to stay soy free, then the coconut aminos are what you’re going to want to use and pretty much identical in taste. Sugar free honey?!?! Yup, no joke. Now, obviously, it’s not from the bee hive. But you do have options! You can order it from Amazon (and sometimes you can find it at your local grocery market) or make it yourself. Personally, I buy it because making it still requires purchasing special ingredients and I like to save the step…but here’s the recipe for “homemade keto honey” if you want to make it yourself. Please note, if you’re a Trim Healthy Mama you need to use this homemade syrup instead and just leave out the maple extract, or only a drop or two of the maple if you like that hint of flavor. This syrup reduces just like the honey will! The other flavors that go in this sticky “chicken” sauce to give it its authentic Asian flair are rice vinegar, ginger paste, minced garlic, and sesame oil. And, of course, sesame seeds and (optional) green onions for garnish. To thicken this sauce, normally you’d use about 2 TB of corn starch mixed into 1/4 cup of cold water and slowly add it. However, to keep this a keto approved, low carb, Trim Healthy Mama compliant meal, you’ll use konjac root powder. Sprinkle a tiny bit at a time, as it thickens quickly. You’ll use just enough to get the sauce to your desired thickness (sometimes I don’t use any!). Seriously, the tiniest pinch (like 1/16 tsp) could be enough, so add it slowly. How Do You Make Keto Sticky Chicken Sauce? So first you’re going to combine the soy sauce (or coconut aminos), low carb honey of your choice, rice wine vinegar, sesame oil, ginger paste, and garlic in a large saucepan (I actually prefer to use this deep cast iron skillet for this recipes – and most others, as I ADORE cast iron!). Tip: You can also add a couple drops of sriracha sauce to the pan if you like it really spicy! Let the ingredients simmer, stirring so the bottom doesn’t scorch. It should thicken up with time, but if you want to make it “stickier”, you can sprinkle in your gluccie powder. You’ll know it’s “just right” when you stick your spoon in and it coats it. Hands down, every time, the sauce makes the meal. 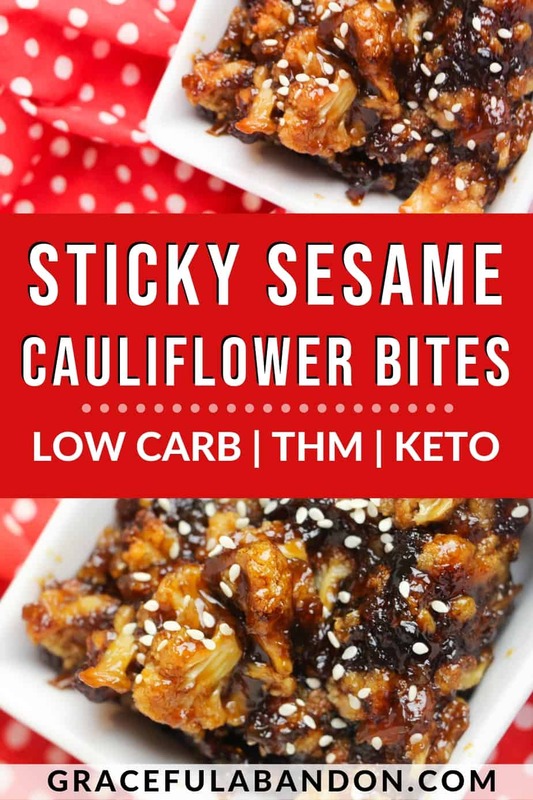 And this low carb sticky “chicken” sauce turns your crispy cauliflower bites from a pretty good veggie into an absolutely amazing sticky sesame cauliflower treat that you crave. Pull your crispy cauliflower bites out of the oven, toss them in the sauce on the skillet, and then return them to the cookie sheet and bake them for an addition 3-5 minutes to really make that Asian sesame glazed super sticky. This is best served fresh and hot. It pairs beautifully with Asian slaw or, for those non-low carbers in the house, rice. You can either keep this in an airtight container in your fridge for up to a week or choose to freeze it. When you reheat it, sprinkle it with a few drops of water and then either microwave it or bake it. Baking will give you the best result, but either way it will be soften than the first time. It’s still sticky sesame cauliflower, but it won’t be crispy. These crispy cauliflower bites coated in sticky "chicken" sauce are absolutely amazing. They are the Chinese take out you miss! Make Asian sticky cauliflower bites in just under an hour. Bake cauliflower at 425 for 15-20 minutes, turning once when bottom is golden brown. Continue cooking until both sides are golden. While cauliflower is baking, combine soy sauce, sugar free honey, ginger paste, rice vinegar, and sesame oil in a sauce pan or deep skillet. Bring sauce to a simmer, and stir occasionally as it thickens, approx 7 minutes. If necessary, add a pinch of gluccomannon to thicken the sauce. Sauce is thick enough when it coats a spoon. Once the cauliflower has baked into crispy bites, remove from the oven and add to the thickened sauce, tossing it completely. Return coated cauliflower bites to the cookie sheet and bake an additional 3-5 minutes to make "sticky." You can make 1-2 heads cauliflower for this recipe, depending on their size. This feeds up to 6 people. There are 8 net carbs per serving if you spread if you serve 6. If you're really hungry and serve 4, it's 12 net carbs for the meal. Please note, if you're a Trim Healthy Mama you need to use this homemade syrup instead and just not add the maple extract, or only a hint of the maple if you like that hint of flavor. This syrup reduces just like the honey will, and even though it will crystallize when cold, will be fine when you reheat it.